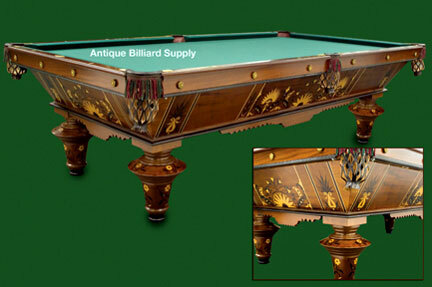 #3-03 Very early antique pool table by J. M. Brunswick Company. Rare 1870s model with extensive ornamental inlay in a floral motif. Mahogany cabinet with hand-cut pieces of walnut, ebony, satinwood, maple and other rare woods. Floral inlay pattern continues on each of the round legs. Rosewood top rails with ivory diamond sites. Nine-foot regulation size with original four-piece playing surface of Vermont slate. Completely restored.